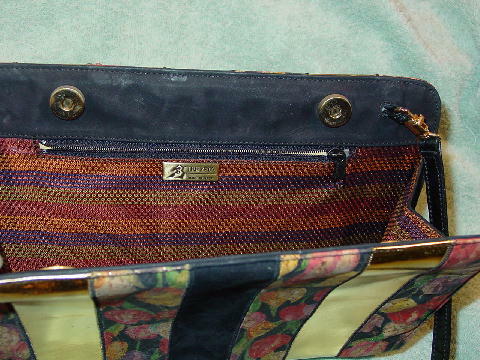 This vintage leather Trezeta purse was made in Italy. It has an alternating floral pattern (they look like tulips to us) on a black background. 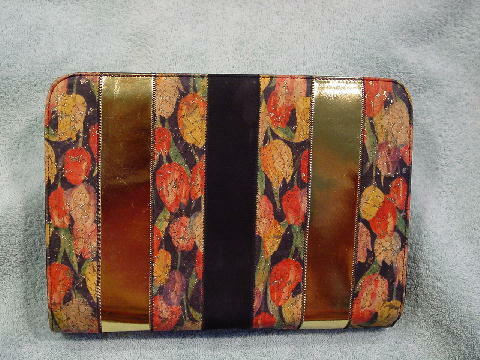 The vertical panels are 1 1/2" wide in gold lame and black suede. The tulips are in coral-red, maize, eggplant, bone, carnation pink, peach, and there are line crevices filled with glitter. The side panels are black suede, as is the interior 1 1/2" rim. 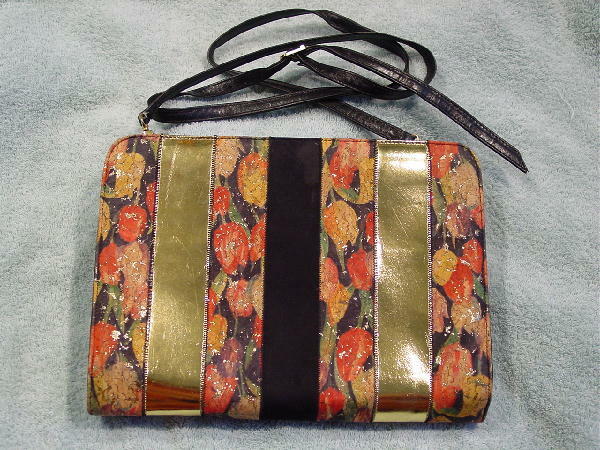 It has two gold-tone magnetic snap closures and a 54" long black leather 5 hole shoulder strap. There are some surface scratches on the gold lame panels front and back, and there is some tarnishing at the top of one of the lame panels. There is a tan leather lined interior zipper compartment, and the lining is a soft fabric in horizontal lines of burnt orange, rust, black, and lime green with burnt orange designs running through the colors.